Genuine Al-Rehab Body Spray Deodorant from Saudi Arabia. The same beautiful fragrance now available in body spray version. This is a beautiful, long lasting scent. 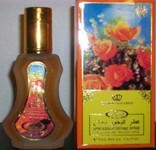 Al-Rashad has a great price and selection of perfume oils and ships very quickly. WOW excellent smell very good i sent fro gifts too!! !